BBC Sherlock Fan Forum - Serving Sherlockians since February 2012 » "solving crimes"
I didn't think of it until recently, and I doubt Mycroft was trying to do a double entendre, but doesn't he make "solving crimes," sound a lot like the way Irene makes "have dinner" sound? "You just met him and now you're 'solving crimes' together?" John saying that "we solve crimes and then Sherlock forgets his pants." Sherlock's invitation to Molly in TEH, because John has apparently "broken up" with him. And then Sherlock thinks about John while he's doing it with Molly. 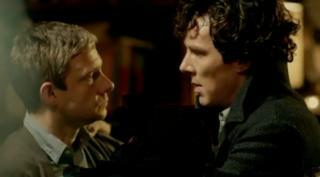 And the way it turns out, makes me think of Sherlock thinking, "It's better with John." And, if you think about, this is kind of the way Sherlock shows friendship / intimacy / caring about someone: inviting them to participate in solving crimes. And his involving Molly and others in his plot to fake his death, and NOT John was kind of his form of cheating on John. Not something he could do with Irene though. She'd be good at it, but he wouldn't trust her enough. I think you have a point there; in TEH when he asks Molly to assist him solving a few crimes; it is what Sherlock sees as friendship I suppose? It's the ultimate trust he can put in someone. In A Study in Pink, Donovan even says Sherlock "gets off on" his work...and then he asks John along and John says "Oh, God, yes!" So the invitation to solve crimes becomes something of a seduction. Not to mention when he's trying to reunite with John in TEH, and tries to "tempt" John with the thought of, "the thrill of the chase, the blood pumping through your veins, just the two of us." If you think about, that last part, "just the two of us," doesn't really belong there, or doesn't HAVE to be there. Sherlock could have said, "you're thrilled by the thrill of the chase"; but here, he's essentially saying John is thrilled when it's just him and Sherlock. While I see the argument for the friendship Sherlock finds in "solving crimes together," I believe that was not Sherlock's original motivation for involving John and later giving Molly a try. 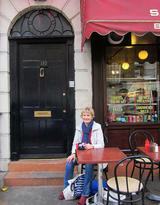 At the very beginning, in ASIP, Sherlock asks Lestrade who's on the case, and then says, "Anderson won't work with me." Lestrade responds, "Well, he won't be your assistant." And Sherlock says, "I NEED and assistant!" Likewise with Molly and later more-or-less jokingly with Janine, he was looking for an assistant. And it may be that his later efforts to replace John stemmed from a need for not only and assistant but also a friend. Who knows what goes on in that funny little brain of his?